Steve Minon and Matthew Bailey, the creative minds behind Harajuku Gyoza and Nitrogenie, have cooked up another magical venue with Fritzenberger, Caxtonâ€™s St latest microbrewery. Fritzenberger opened last month and sadly took over Casablanca bar which had been there for 23 years. However, theyÂ will make sure the alcohol continues to flow and the tunes keeps our toes tapping. 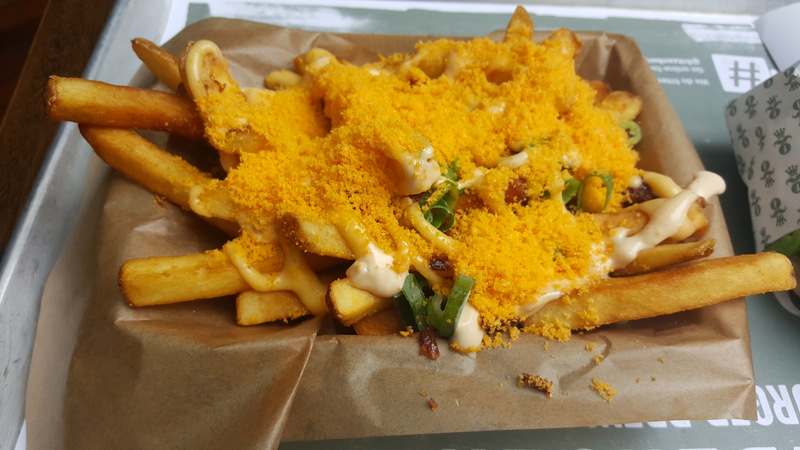 Like the name suggests, Fritzenberger is all about fries and burgers but that’s not all they have to offer. Being a bar, they have a long list of ice cold beverages to complement their meals, not to mention their own in-house brews. TheÂ microbrewery can be seen on the upper floor of the venue if you have any doubts. With just one step off Petrie Terrace into Fritzenberger, the high ceilings and airy space which is atypical of most bars, coupled with the bustling activity and day chatter, makes for a great Sunday vibe. To the right of the silver tanks of beer, a wall of historical people like Queen Elizabeth II, Lauren Bacall, Mona Lisa and JFK can be seen wearing the soon-to-be iconic Fritzenberger moustache. Whereas downstairs, more seating space can be found in a cool cellar bar with stone walls. From the concise menu, I chose the house named burger, the Fritzenberger. This gave me a grass-fed beef patty from NSW, aged cheddar, hydroponic lettuce, organic tomato, spanish onions and their house made Fritzensauce. It was a classic burger that was devoured in two minutes yet didnâ€™t leave me with the guilty aftertaste. The ingredients tasted fresh and the controlled flavours were able to please the tastebuds without being greasy. You canâ€™t complete a burger experience without fries so I ordered the loaded frites. This gave me cheese sauce, candied bacon, green onions, Fritzensauce and Twisties salt! The Twisties salt definitely made the fries burst with flavour. The ice cream burger is a lovely addition that keeps in line with the venueâ€™s vision. Even the dessert is a burger(?) 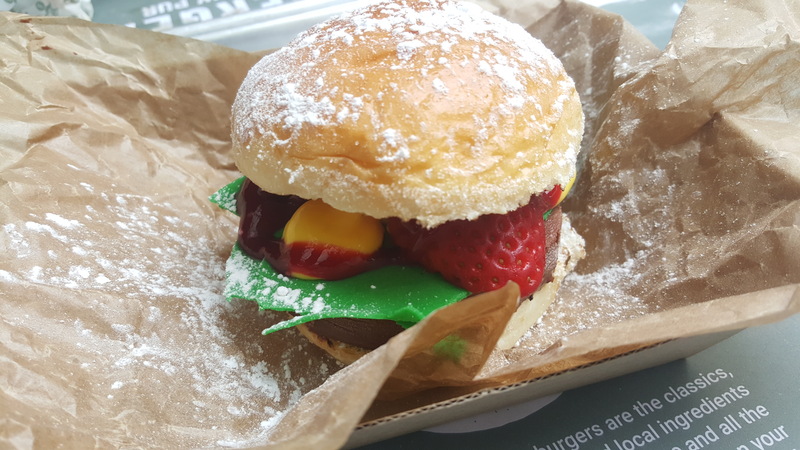 Sweet milk bun with chocolate ice cream patty, strawberries, raspberry ketchup and custard was simply delectable and fun to chow on. Definitely give this place a go with your mates and enjoy the beer and fun atmosphere, whether during the day or night.